The PAC primarily responsible for sustaining Democrat Andrew Gillum's candidacy in the Florida governor's race raised an additional $1 million from small donors nationwide to help pay legal bills for a recount fight in Florida that fizzled out when Gillum's margin of defeat was too large to trigger a hand recount. Furthermore, at the time when the fundraising blitz began, the PAC Forward Florida was already sitting on about $3.5 million on hand even though the retail campaign had just ended. According to a Washington Free Beacon analysis of campaign finance data, the Forward Florida PAC had primarily been driven by large donors contributing $250 or more prior to Election Day, with about 700 of those donations in total coming before mid-September of this year. However, once it became clear the race between Gillum and Republican Ron DeSantis might extend beyond Election Day, the call went out urging progressives across the country to donate to Forward Florida. Fortunately, Andrew Gillum — who Democracy for America endorsed the same week his campaign launched in June 2017 — has a rapid response legal team on the ground ready to contest every vote not counted. This legal work is expensive for a campaign, especially in a large state like Florida. That's why Andrew's campaign needs us urgently: Chip in $3 or more to Andrew Gillum's team at Forward Florida PAC (and to DFA) today. Thank you for your support for Andrew. Now let's bring it home. Campaign finance data shows that between Nov. 8 and 16, about 23,000 persons responded to this and other solicitations despite the fact that Forward Florida was already flush with cash. Roughly 20,000 of the contributions were $15 or less. A representative with the PAC did not return a request for comment on whether refunds were warranted or would be honored, and if not, what plans the PAC had for the money going forward. The Forward Florida PAC was instrumental in sustaining Gillum through the earliest parts of the campaign at a time when he was struggling with fundraising compared to other Democrats hoping to win the party’s nomination. In particular, in the late months of 2017 and the early part of 2018, liberal political financier George Soros made significant six-figure donations to the PAC aligned with Gillum's candidacy. 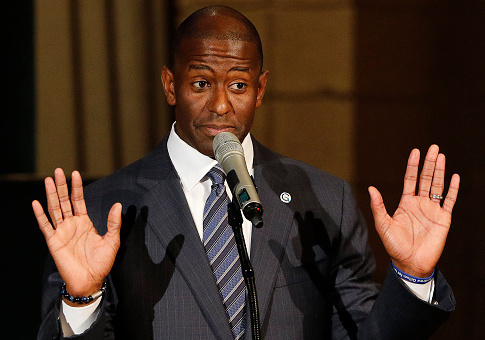 "I'll tell you, I'm obviously deeply appreciative of Mr. Soros, as well as Mr. [Tom] Steyer, both men whom I've known for some time," Gillum said on NBC's "Meet the Press" in September, shortly after winning the Democratic nomination. More currently, news reports say Gillum has recently reached out to fellow Democrat Beto O'Rourke, who lost in the Texas senate race to incumbent Republican Ted Cruz. O'Rourke is considered a contender for the Democratic presidential nomination in 2020. This entry was posted in Politics and tagged 2018 Election, Andrew Gillum, Florida, George Soros. Bookmark the permalink.